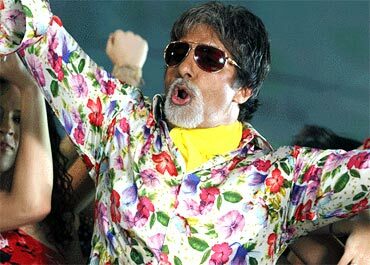 The Bachchan patriarch turns 70 next year but in his forthcoming film Bbuddah Hoga Tera Baap, he is as flamboyant and colourful as ever. 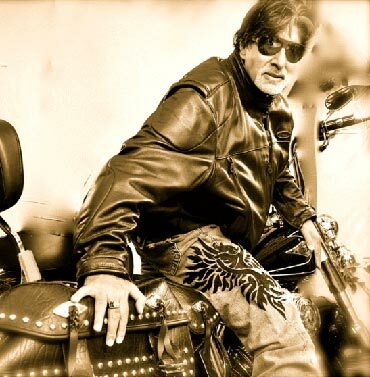 Amitabh Bachchan talks to Patcy N about the generation gap -- or lack of it -- his relationship with his father Harivansh Rai Bachchan, with his own children Abhishek and Shweta, and grandchildren Navya Naveli and Agastya. You look dashing in this film. What made you chose this film? It was the character of the film, the look I have in the film. In real life you can see how I am -- next year I will be 70. But because I liked this story I thought of doing it. Puri Jagannadh is a very capable director. I have seen his film Pokiri which was later made in Hindi as Wanted and Salman Khan acted in the film. I liked the film. Ram Gopal Varma brought Puri Jaganath to me. Ramu told me he is a good director and I should work with him and he had a good story too. After I heard the story I decided to work in the film. After hearing the story I also felt that we should produce the film and we all agreed on it. My advice was that we should make the film on a low budget - it cost approximately Rs 10.5 core. We have already sold the satellite rights for approximately Rs 14 crore so we have already recovered our cost of production. In today's world, it is very necessary to do this. Films never fail; all films are made well, but sometimes because of the cost of making it, you can have problems. It looks like you enjoyed making this film. I enjoy all my films. This is the story of an ex-gangster, Viju, who is now living in Paris and owns a pub there. He is called to Mumbai to complete a mission. I can't tell you what is the mission -- you will have to watch it. Have you ever used slang in real life, maybe in your young days, like Bbuddah hoga tera baap? You cannot mix personal life with the character, it won't be fair. I have always tried not to use vulgar language in my career, in my films or for my character. I don't use vulgar language and don't do explicit scenes because I am not comfortable doing it and plus I think my family should not feel disgusted with me if they go to see my films and hear vulgar language. I won't talk about my personal life -- it is too personal. Did Puri Jagannadh write the story keeping you in mind? The original title of the film was just Bbuddah; then how did the name change? Yes, the original title was Bbuddah and we added the tag Hoga Tera Baap. Then Abhishek thought that the whole thing should be the name of the film. In north India, Bbuddah hoga tera baap is not slang, but used commonly. Also, the problem was that people thought the film was on Gautam Buddha, that's why we kept experimenting with the spelling, but it was still difficult to put across the point that it was not about Gautam Buddha. I tweeted about it, I wrote about it on my blog, I spoke to the media but nothing helped, so in the end the change in the name in the title helped. You have a very young look on the film; how did you work on the look? 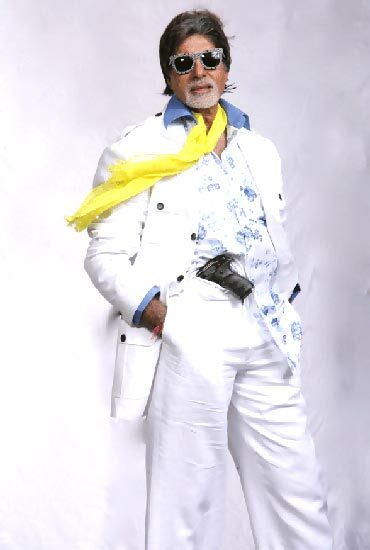 When I spoke to Puri he said the character should be flamboyant and colourful. He is a jolly person but he has a little arrogance and attitude. So my designer worked accordingly. I have also contributed a few things to my look. How do you cope with the changing times? Yes, that is a perennial problem with all of us. You grow up in a certain era, your parents and your upbringing is conducted in a certain manner. As you grow up, the things you learnt when you were under your parents' care will always remain with you throughout your life. My parents are no more but even today if I have a problem or issue the first thing that I ask myself is: what would my father have done, or what would my mother have said, and somehow we find the solution. We always get solutions from our elders' talk. But we have to move with the times also. The new generation is brighter, smarter, aggressive, more determined, very keen to succeed. They are faster, they speak and move fast, they have a cryptic language, they say ten pages of words in just a few- 'yeah, that's cool'. You have to move with the times. On the sets of the film my average age is about 25 but in real life I am close to 70, so yeah, there is a huge gap. I enjoy the enthusiasm of the youth today. I like listening to what they are listening to, I perhaps wear the clothes that they wear and talk the way that they talk. Just being in their company is nice. That's the way I am, I am not doing it deliberately, it just happens naturally, I like what they see and listen to. I am pretty relaxed about today's youth. I am sympathetic to their causes most times provided they remain within certain parameters. I had decided much before Abhishek was born that if I had a son he would be my friend rather than a son, and the day he started wearing my shoes, he became my friend. So now I treat him as a friend. I very rarely look upon him as a son. I am concerned about him as a father, I would look after him as a father, I would advice him as a father, but when I talk to him, we talk as friends. Could you identify with the character that you played in the film? Not really. I couldn't go out and start smashing up people. It is a different relationship between me and Abhishek than with my father and I. My father was a man of letters; one always saw him at his desk writing or busy with his work. So there was a natural distance, not because he wanted to create a distance, but because we wanted to leave him to his creativity. But the relationship between father and son was just like it is with Abhishek and me. My father and I would talk casually about many subjects and have laughed over many things and many of the examples that he set for me in life I still use them today. One thing l have learnt from him and I have spoken about it many times is that Man ka ho to achha, na ho to aur bhi achha. You said that before Abhishek was born you had decided that he would be your friend. Does the same apply to your daughter Shweta? Shweta, because she was a girl, I thought that she should be given the space of a woman of the house. Women are very important elements. I had decided on one thing: that I would not differentiate between them. When I die whatever little I have will be equally divided between my daughter and my son -- there is no differentiation. Jaya and I decided on that long time back. Everybody says that the girl is paraya dhan, she goes to her husband's house, but in my eyes she is our daughter, she has the same rights Abhishek has. 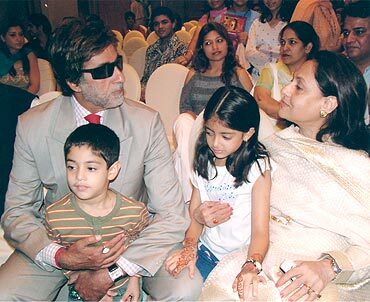 You are very attached to your grandaughter Navya Naveli? Yes, I am. They are masters, they are no longer 13-year-olds. She is like a grandmother. They are just unbelievable. If I don't know how to operate my phone or my computer, I ask Agastya. He is eight years old and he fixes it. That is the generation of today.